this is a blog called geometricsleep. : Someone call the waaahmbulance! Along with the Chanel lace/black tights, there was another accessory that I desperately wanted this season; the Miu Miu initials. I dutifully went into the store to inquire and they told me they were selling them by special order only. Pretending like I was some high roller, I actually placed an order for the letters "L" and "G" and left my credit card information. Time went on. Mid-September I went by the store and they told me that they would come in sometime in October. Along the way some garbled message about not being able to place an order, or letters getting sent or some other malarky made its way to me, but I didn't pay much attention to me. If you place an order it means you get what you ordered right? Well, I got a call from the store today telling me that they only got in a "G". I called back and asked if any other stores got an "L", the sales associate said no stores got it and the letters were only available in the boutiques. I sighed. I said thanks, but no thanks, after all, what would I do with just one letter that isn't even my name initial. Honestly, I'm pretty disappointed. Why tell me that they were only selling them by special order if they were just going to get random letters regardless of what customers wanted? On the plus side, not spending money is always good. 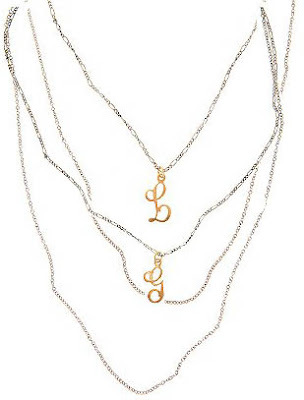 So now I'm looking at these initial necklaces on the Urban website. I like them cause they're a little gaudy and they fit in perfectly with all the necklaces I've currently been wearing. Plus, two of them cost less than one Miu Miu pin. like hip hop ya don't stop. i see gold fronts in your future.